NHL News : Bruins lose two of their top players to long-term injuries. Bruins lose two of their top players to long-term injuries. Bad news for the Bruins. The Boston Bruins mounted one of the most impressive comebacks of the entire 2017-2018 National Hockey League season earlier this week when they faced off against the Carolina Hurricanes. While early on the game appeared to be all Hurricanes, they took the lead with three unanswered goals in the second period, things cxhnaged drastically in the games third period when an offensive explosion from the Bruins left the Hurricanes shell shocked. 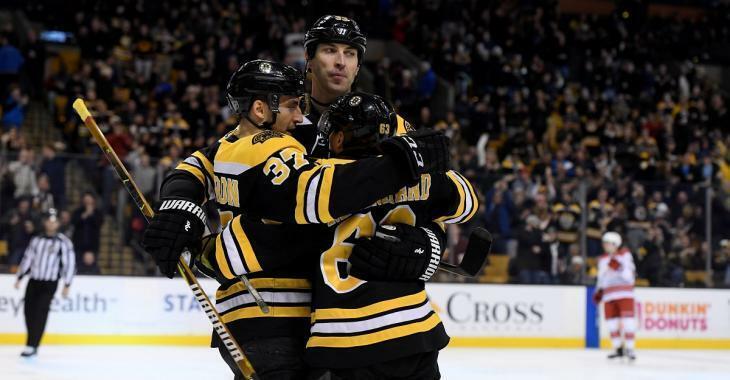 In a comeback that was reminiscent of the one the Bruins mounted against the Toronto Maple Leafs during the 2013 National Hockey League playoffs, also a three-goal deficit, the Bruins scored three unanswered goals in just over a minute to tie the game up against the Hurricanes. While they would tie the score at 4 - 4 after those three goals, they continued to rain down pucks on the Hurricanes net and the game eventually ended with a score of 6 - 4 in favor of the Bruins. It was a a massive win for the Bruins and while it almost certainly felt great for the team at the time their exuberance over the huge comeback win was likely short-lived. While yes it's true that the Bruins did pull off one of the most epic wins of the season it has also come as a huge cost, and while the Bruins knew two of their top guys got hurt, what they didn't know is how bad those injuries were. According to a breaking news report from Bruins insider Joe Haggerty of NBC Sports, the Bruins have lost both veteran defenseman Zdeno Chara and rookie forward Jake DeBrusk for the long-term. Haggerty reports that both players have been ruled out of the team's remaining games on this current road trip, and furthermore there will be no updates on either man until they return to Boston and meet with the team's medical staff. Chara was injured during the third period against the Hurricanes when he went crashing into the boards awkwardly, and based on his reaction to the play it appears that his shoulder may have taken the brunt of the impact. Chara could be seen on the bench wincing in pain and motioning to his shoulder, so it seems like a safe bet to suggest that is where the injury occurred. As for DeBrusk, he was injured when he got caught up with 23-year-old Hurricanes center Elias Lindholm during the games first period. While DeBrusk was injured early in the game he tried to fight through the pain and only ended up leaving in the third period. You have to hope in his case that he didn't make things worse by trying to play things tough. While head coach Bruce Cassidy was optimistic the injuries wouldn't be long-term, we now know that it's a minimum of two games for both players, he did admit that there may be bad news on the horizon once the medical tests are performed on both players. “Upper body. Won’t play tonight and won’t play Saturday. We’ll have a better idea on both of them next week once we’re back in Boston,” said coach Bruce Cassidy as per Haggerty. “I can’t really answer to [the severity]. I’m not worried it’s long-term, but once [Chara] gets further evaluated we may get bad news. But that’s kind of the initial reaction right now." Stay tuned for more updates on these two.